With this year’s thaw in diplomatic relations between the US and Cuba, it has become much easier for US tourists to visit. Just 90 miles south of Florida, this Caribbean island nation gives you a feeling of being caught in a time warp as you walk down streets lined with centuries-old buildings and cars from the 1950s. There are stunning cathedrals, quaint plazas, plenty of cultural attractions and the famed Tropicana nightclub still going strong, even though Cuba is clearly not the mecca for socialites and celebrities that it was in the 1950s before Communist rule. Violent crime is rare. The Cuban people are very friendly—many speak fluent English. And there are plenty of spectacular beaches. Despite the easing of travel restrictions, technically Americans still are allowed to visit only for specified purposes. These include visits to relatives…journalistic and educational endeavors…professional research and meetings…religious activities…participating in public performances, workshops or competitions…humanitarian projects…or activities related to private foundations and institutes. But you no longer need to convince the US Treasury Department that the trip should be allowed for one of these reasons. Now you simply check a box on a form to specify which of the allowable reasons applies—no questions asked. Example: Someone who is active in a church or synagogue might check the “religion” box on the form if he/she intends to devote a significant part of the trip to interacting with the Cuban religious community. If you join a tour given by a US-based tour provider, it will ensure that your trip is legal. Most such tours qualify as educational because they feature “people to people” encounters—tour group members meet Cubans and learn a little about the local culture. Join a “people to people” tour group that includes a charter flight—the flight time from Miami to Havana is less than one hour. 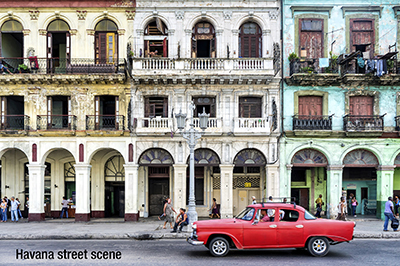 US-based tour companies that offer trips include National Geographic Expeditions (NationalGeographicExpeditions.com)…dance and music-focused Plaza Cuba (PlazaCuba.com)…and ­budget-minded Insight Cuba (InsightCuba.com/Cuba-tours). Example: Insight Cuba’s five-day “Weekend in Havana” tour starts at $2,595 per person (plus $645 to $745 for round-trip airfare from ­Miami), including lodging, most meals, in-country transportation, entrance fees to scheduled activities and more. Fly through a third country. You can travel without a tour group from Canada on Air Canada (AirCanada.com)…from Panama City on Copa (CopaAir.com)…from Nassau in the Bahamas on BahamasAir (BahamasAir.com)…or from George Town on Grand Cayman island on Cayman Airways (CaymanAirways.com). These airlines can provide your Cuban visa (also known as a “tourist card”) on the spot at the departure airport. To obtain a visa, you will need a passport valid for at least six months from your date of entry. The fee is about $25. ­Cubana da Aviacion, the Cuban national airline, offers flights to Cuba from Mexico and several Caribbean islands. Warning: Do not list your occupation as police, military or government employee—the Cuban government is suspicious of these. Viazul bus service is the best way to travel between cities in Cuba (Viazul.com). The buses are modern, air-conditioned and reasonably priced—but tickets must be purchased at least six days in advance, which is best done over the Internet before arriving in Cuba. A 120-mile trip from ­Havana to Viñales, which boasts stunning natural beauty, costs $12, for example. Taxis (and rickshaw-like “bici-taxis”) are the best way to travel within cities. Negotiate a fare before getting in to avoid exorbitant charges. The typical one-way taxi trip in Havana should cost between 2 CUC and 5 CUC. One CUC, or Cuban convertible peso, essentially equals $1—see below for important details about currency exchange. Confirm that the amount you settle on is the total fee, not a “per passenger” charge. Warning: Renting a car is risky. Accidents that result in death or injury are considered crimes and can result in long prison sentences. Stroll around Habana Vieja, or “Old Havana.” It’s full of Baroque churches and castles that seem straight out of Madrid. Especially notable are the Plaza de la Catedral…Plaza de Armas…Plaza Vieja…and Paseo de Martí. Go to the Tropicana, which is comparable to a Las Vegas nightclub—and just as expensive (entry costs 75 CUC to 95 CUC). Pay waiters as close to the exact amount as possible—they sometimes “forget” to return with change. Tipping customs in Cuba are comparable to those in the US. Alternative: If you prefer Latin Jazz to showgirl glitz, head to the Bar Chico O’Farrill in the Hotel Palacio O’Farrill on a Friday, Saturday or Sunday evening. Enjoy excellent restaurants—many with entrées such as braised lamb, roast pork or garlic shrimp priced below 10 CUC. Popular restaurants include Doña Eutimia, La Guarida and El ­Cocinero. The best beaches include ­Playas del Este, east of Havana…Playa El Frances, on the Isla de la Juventud, the largest of Cuba’s offshore islands…Playa Flamenco on Cayo Coco in central Cuba with fine white sand…Playa Mayor in Varadero, lined with hotels and thatched-roof ­restaurants…and Playa Ancón near Trinidad, with great scuba diving. Valle de Viñales in Viñales National Park in western Cuba features spectacular scenery. Dramatic hills and traditional tobacco farms give the region a timeless, romantic quality. Best restaurant: Restaurante El Olivo. Trinidad on Cuba’s southern coast is the most charming colonial town, with cobblestone streets, terra-cotta-tile–roof homes, mule carts, cowboys and an abundance of songbirds. Best restaurant: Vista Gourmet, a rooftop buffet. Santiago de Cuba, a city on Cuba’s southern coast that has African and Haitian cultural heritage, will have celebrations to mark the 500th anniversary of its founding this year, highlighted by the city’s carnaval from July 20 to 27. Examples: In Havana, try Hostal del Angel (PradoColonial.com…30 to 35 CUC). In Viñales, try La Autentica (35 CUC). In Trinidad, try Casa Muñoz (Casa.TrinidadPhoto.com…35 CUC). Typical savings for seven nights at a casa particulare instead of a hotel: $1,190. Your dollars will go further if you convert your money twice. Cuba imposes a 10% surcharge if you exchange US dollars for Cuban pesos—that’s on top of the normal 3% commission charged for all Cuban currency exchanges. To avoid this, convert your US dollars to Canadian dollars or euros before your trip, then convert these to CUC at a Cuban hotel, bank or exchange bureau—the 10% surcharge is imposed only on US dollars. Don’t count on being able to use credit cards. MasterCard is the first card issuer to have unblocked transactions in Cuba, but it is not clear which merchants accept the card so far. Careful with your camera. Many Cuban museums charge up to 5 CUC for the right to take photos, and some Cuban people will request a small payment if you snap their picture. Carry toilet paper with you. It is missing from many Cuban bathrooms (though there might be an attendant who can provide toilet paper in exchange for a tip—0.25 CUC typically is sufficient). Internet access is difficult. There are government-run Internet cafés in most cities where visitors can pay $4.50 per hour of access—you must provide a passport. Your e-mails and browsing will be monitored by the government.